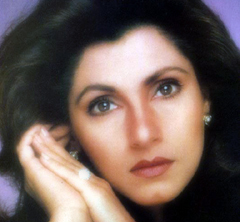 Dimple Kapadia: her journey from a young brash Bobby to a sophisticated lady that she is is worth a read. All of 5 feet and 2 inches, she was born on 8th June 1957 in a Guajarati family. Her father, Chunnibhai, is a businessman and mom’s name is Betty. She has a younger sister, Simple, who has acted in Bollywood films too. Dimple was married to Rajesh Khanna and has 2 children with him: Twinkle Khanna (married to Akshay Kumar) and Rinke Khanna (married to industrialist Sameer Saran), both Bollywood actors. She divorced Rajesh in 1983. • Dimple debuted in Raj Kapoor’s Bobby in 1973. Her innocent sensuality was the key reason for the movie’s success. • After a long hiatus of 11 years Dimple appeared in Zakhmi Sher (1984) with Jeetendra. • Saagar (1985) took her career to sensational heights. • She played Reshma in the action-romantic flick Janbaaz (1986), and looked as pretty as a picture. • She appeared in a serious role came in Insaaf (1987). • She was the lead protagonist in the film Zakhmi Aurat (1988). • Dimple was a part of the horror film Bees Saal Baad (1988). • She played Anil Kapoor’s sis-in-law in Subhash Ghai’s Ra, Lakhan (1989). • She was seen in J P Dutta’s Batwara (1989) with Vinod Khanna, Dharmendra, Poonam Dhillon and Amrita Singh. • In the fantasy Lekin (1990) she starred opposite Vinod Khanna. • As Rukhsana Khan she played Amitabh Bachchan’s love interest in Ajooba (1991). • Dimple gave one of her finest and most sensitive performances in Rudaali (1993). The film was poignant, and gave her ample opportunity to explore her acting skills, which she did beautifully. • She gave another stellar performance in Priyadarshan’s crime-drama Gardish (1993). • As the fiery and righteous journalist in Krantiveer (1994) she made sure that she was not overshadowed by Nana Patekar. • Dil Chahta Hai (2001), the film that achieved a cult status, saw her in a rather subdued role, as a divorced alcoholic in love with a younger man. The sensitivity in her performance ascertained that though her role was lengthy, it was significant. • Being Cyrus (2005) showed off Dimple’s versatility. As the loud and crass Katy Sethna, she blew the audience’s and critics’ minds alike. • Banaras (2006) might not have done well commercially, but it can’t be denied that those who watched it loved it. Playing Urmila’s mother in the film, she appears like the best woman on earth, when actually she is evil incarnated. • In Luck By Chance (2009) she plays Isha Sharvani’s mother, a conceited woman, obsessed with herself and her image in the media. • Her film Tum Milo Toh Sahi is to release in 2009. Dimple has won 4 Filmfare awards, for: Krantiveer, Rudaali, Saagar and Bobby. She was nominated for her performance in Dil Chahta Hai at the Zee Cine Awards. Dimple married Rajesh Khanna before Bobby was released. And even though the film was such a huge success she retired from films, only to return after her divorce with Rajesh Khanna, a gap of more than 10 years!